Gaga Hoho should seem familiar to those who’ve trawled the South Korean streets of Dongdaemun or Myeongdong. 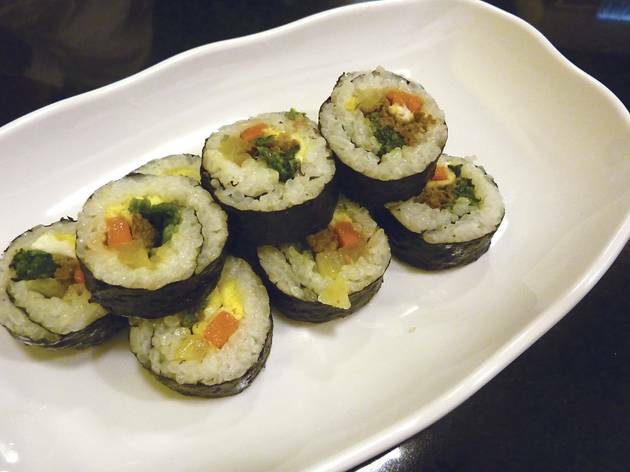 The restaurant channels cheap and cheerful vibes geared towards a younger clientele. Expect uncomfortable stools, cramped surrounds and, most importantly, an awesome selection of Seoul-style street food. There are well over 60 snackish dishes on offer, from kimchi pancakes ($50) to dubboki rice cakes stir-fried in sweet pepper sauce ($45). And as a tribute to Korea’s obsession with good ol’ American junk food, the restaurant also dishes up homemade burgers served with crisp and golden fries. A must-order here is the brilliant jajangmyeon ($50). The thick wheat noodles come heavily smothered in a rich and sweet black bean sauce that’s studded with bits of chopped onions and minced pork. It’s a beautifully delicious mess that’s worth all its sauce splatter. Not all noodles here are made equal though. Skip the chewy naengmyeon buckwheat noodle dish ($60), which has strands that stick together in a hard, cake-like mass. The chilled beef broth it’s served in lacks tang and is near flavourless without copious amounts of additional vinegar and mustard. 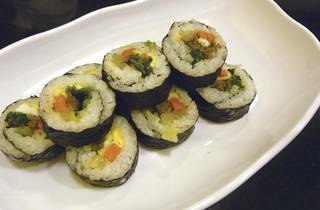 The restaurant’s kimbap ($35) – a Korean version of maki sushi rolled with meat, cucumber, carrots and pickled radish – is also rough around the edges, filled with rice that’s overcooked and slightly pasty. The soondae sausages ($50), on the other hand, are scrumptious morsels. The bite-sized rounds of blood sausage are plumped with gamey bundles of vermicelli noodles and barley. It’s especially addictive after a quick dip in the accompanying pile of coarse salt, cracked black pepper and red chilli flakes. The spicy barbecue pork ($70) also shines with deliciously tender meat that’s blanketed under a coating of hot and savoury chilli paste. Gaga Hoho turns out the sort of food that teens in Korea are eating right now. There are a few misses on the menu but, overall, food here is cheap, greasy and deliciously gratifying.